Your browser has a problem and can not display the Midland Auctions website correctly. (48z) - Two framed reproduced ads from 1930's, Whiz motor oil and Kelly Tires. Great for the cave. You must LOG IN or REGISTER to see this full page auction listing and bid. 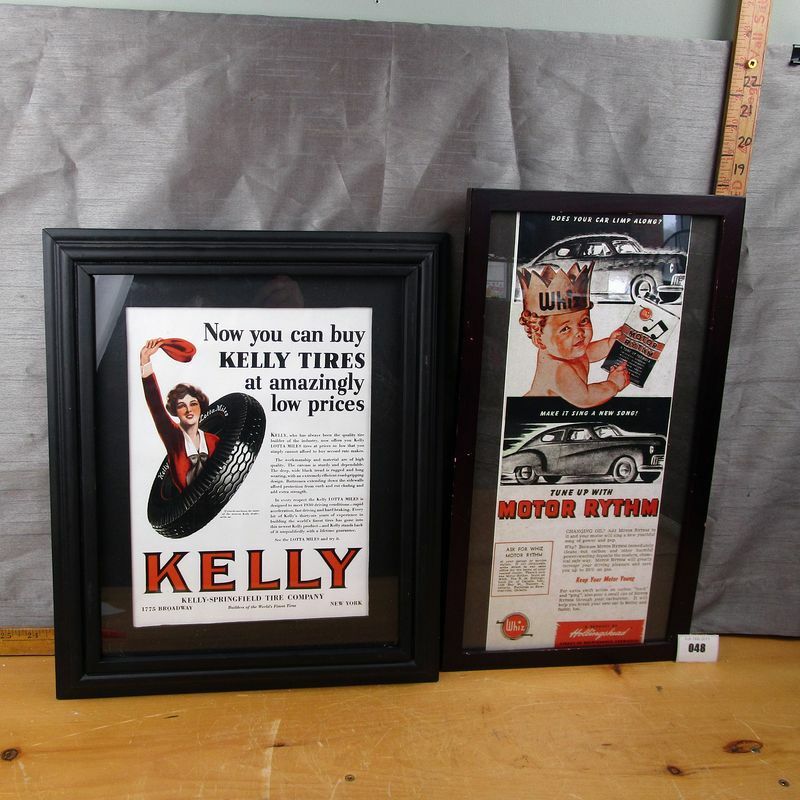 **Lot Details: (48z) - Two framed reproduced ads from 1930's, Whiz motor oil and Kelly Tires. Great for the cave. This lot has the "SOFT CLOSE" feature turned on. This means that if a bid is placed in the last 5 minutes of the auction the auction end time is extended 2 minutes - This effectively stops bid sniping (Beating the previous bidder in the last few seconds of the auction). This lot has the ability to use a "PROXY BID" where you can enter your MAXIMUM bid amount and the computer will bid for you as needed but only when someone tries to outbid you. Click here If the login above stalls or does not work for you. If the Alternative Login page does not work please try another computer or device to log in. If you do not remember your username you can use your email instead. You can also recover your password below. New users who just registered will not be able to log in right away, Check back shortly as we will review your registration and approve your account manually. Click here If you can not remember your password. We can email you a reset password link. * Closed Sunday, Monday & Holidays. MAP: Click here for map. • Please DO NOT COME EARLIER OR LATER than the above posted times. Even if we are on location we will NOT assist you before or after posted hours. If you are early or late please come back at posted times. • We are closed ALL SUNDAYS, ALL MONDAYS & MOST HOLIDAYS so no pickup or drop-off is available these days. • Tuesday & Saturday mornings are often busier, if you have items to consign or wish to be paid out this is often a BAD time. Customers picking up auction items are helped first so you may be waiting a while if you come at these times. Wednesday to Friday are best if you can make it. • Please view the [Bad Items] list and keep in mind that if your item does not have potential to reach 20.00 we will either return it to you or add it to another lot, we get lots of low value items from estates so we do NOT accept low value items as general consignments. Please also check local weather we want everyone to stay safe. Invoices are generated a few hours after the auction closes. If you are bidding on items this week please check your INVOICE page on Monday to confirm the items you won. Items will be moved from your bids and status page to your invoice page. Please do not rely on email to tell you if you won or were outbid. Emails often get stopped or filed as spam/trash/bulk so they are unreliable. Check your INVOICE page on Monday to see if you won anything that needs to be picked up. Please do not be late paying for your items. We never want to charge the late fees as we want all items to be paid for on time but… if you feel the need to be late please be aware that a $10.00 PER LOT late fee will be added to your invoice! NO EXCEPTIONS! If you can not make it in on time for whatever reason you can pay online with interac email money transfer or request that we send you a paypal invoice to pay online with credit card. Please do this BEFORE Saturday. We ship anywhere in Canada. You pay actual shipping rates plus handling. If you need shipping please open a support ticket on the contact us page and request a shipping quote. It is best to do this before Thursday. More details can be found under the questions menu. You have 5 days to pick up your items, if you pay for them on time but can not pick them up we will store smaller items for you for 1 additional week free. Anything that takes up more then 1sq foot will be billed a 2.00/sq foot per week storage fee. At 60 days we will consider your items abandoned and either resell them, donate them or dispose of them and invoice you the costs involved. Furniture or large bulky items will be invoiced a minimum 25.00/week for anything the size or a chair and dressers, tables, cabinets, etc are 40.00/week. Large items 14 days will be considered abandoned and disposal fees and storage fees will still need to be paid. If you purchase a LARGE item such as a appliance or furniture piece or you are unable to lift heavier items you need to bring help with you to load it . Our staff can not assist you in loading items into your vehicle we will bring the items to the counter. Please bring boxes with you, we usually have wrapping material (tissue or newsprint) and bags here but we do not pack dishes or glass items for you as we want you to see the items before packing them to make sure they are in as described condition.